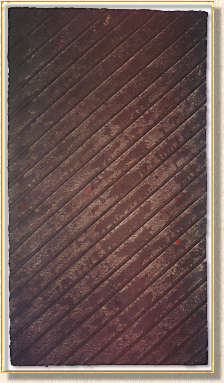 ALTHOUGH NOLAND HAD produced works on paper on occasion prior to 1976, that year marked the beginning of an intense phase of papermaking and printmaking which was to occupy him throughout the '80s. Many "Papers" were made in his Vermont and New York State studios, others were produced on location around the world. The hand made papers and monotypes are a key to the subsequent development of Noland's painting. Their radical character was belied by seemingly familiar formats: many of the papers used parallel bands and centered images within the rectangular formats of traditional easel painting. This has suggested to some that Noland was repeating himself, but if he were, it was to focus the better on something new. Their familiar layouts were dictated by methods and materials as well as by the necessity of framing under glass. Their layouts were neutral armatures for extraordinary material handling. The "Papers" didn't involve the application of color to a ground in a traditional sense; rather, they were all material. Color in the handmade "papers" was in the paper itself, figure and ground merged into a common substance. In the later monotypes, color and embossed relief was applied upon and into handmade paper. 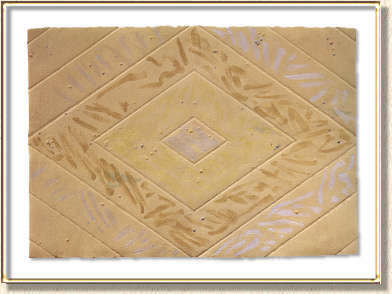 Surfaces of the monotypes were enhanced by relief patterns: diagonal lines, concentric diamonds, and the like. Parts of this pattern were picked out subsequently with applied color; impressed areas were scribbled upon, saturated, accented, left bare. Color enhanced and repressed, merged and separated. Above all, it dematerialized the material. In a sense, the monotypes resembled panels of beautiful fabric rather than traditional prints or paintings. Despite their seeming modesty, these beautiful objects trembled near the limits of pictorial art. They're among the great works of the 1980s, in this sense akin to Matisse's lithographs of the 1920s and '30s.